Families of Formosan languages before Chinese colonization, per شابلون:Harvp. Malayo-Polynesian (red) may lie within Eastern Formosan (purple). 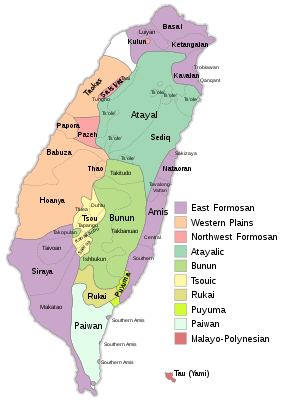 Note that the white section in the northwest of the country does not indicate a complete absence of aboriginal people from that part of Taiwan. On Chinese-language sources, this area is listed as the homeland of various Pingpu groups (e.g. the Kulon), and certain other groups (e.g. the Taokas) are arranged slightly differently than they are on the above map. فورموسا دیللری (اینگیلیسجه: Formosan languages، آنادوْلو تۆرکجه‌سی‌جه: Formosa dilleri، فارسجا: زبان‌های فورموسایی) آوسترونزییا دیللرینین عائیله‌سیندن ساییلیر. بۇ دیل تایوان دا دانیشیلان بیر دیل‌دیر. ↑ 臺灣原住民平埔族群百年分類史系列地圖 (A history of the classification of Plains Taiwanese tribes over the past century). یوْخلانیلیب2017-03-04. اینگیلیسجه ویکی‌پدیاسی‌نین ایشلدنلری طرفیندن یارانمیش«Formosan languages»، مقاله‌سیندن گؤتورولوبدور. ( ۹ فوریه ۲۰۱۸ تاریخینده یوْخلانیلیبدیر). قارداش پروژه‌لرده فورموسا دیللری گؤره داها آرتیق بیلگی‌لر تاپابیلرسینیز.